I recently stumbled across an article discussing a teen who struggled with alcohol abuse fueled by a friend’s mother. Adults providing teens with alcohol is hardly a new thing, but it could become rarer if more adults would make responsible decisions to protect the teens in their lives. If you’re an adult with teenage children or in a position of leadership over teens, make wise decisions. Don’t buy alcohol for underage youth. Don’t allow drinking parties in your homes. Talk to your teens about safe decisions regarding dangerous substances. 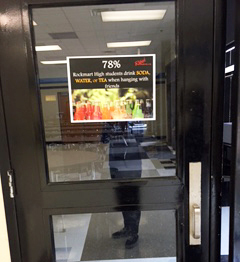 78% Percent of Rockmart High Students Make Wise Drinking Decisions! 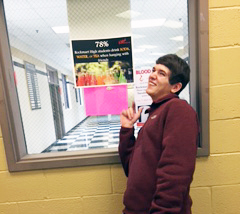 Rockmart High Students conducted a survey among their classmates and found out that 78% of Rockmart High students drink SODA, WATER, or TEA when hanging with friends! Contrary to popular teen beliefs, everyone is NOT drinking. Most kids choose NOT to drink alcohol in their underage years. If you’re a teen struggling with peer pressure to consume alcohol, remember that you’re not alone in making wise decisions. Rethink the drink! 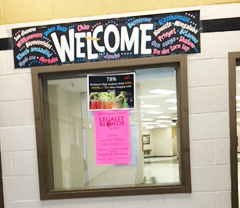 Thanks, Rockmart High, for sharing your positive information!! Peer pressure can feel overwhelming when you’re young and under the stress of school, social life, and impending adulthood. However, YOU are your own best friend. YOU can say “no” to anything you don’t feel comfortable doing. Don’t want to drink with your friends? Be up front about it and say “no”. It’s hard to stand up for yourself, yes, but if your friends are real friends, they will respect your decisions and choices. We believe in you! Make wise choices and rethink the drink!! It took me aback, but the article had sources and many well-founded statements. I think all drugs are dangerous and gang activity is typically violent and damaging. However, there is no doubt that alcohol is usually more easily accessible for minors than many other drugs. Alcohol can lead to a host of illnesses and can even result in death (even if from just one night of binge drinking). What are your thoughts?